Photo: Celebration service inside the massive Nongthymmai church. Across the vast expanse of India, you’ll find cultures as broad as the Bay of Bengal and as unique as the Taj Mahal. In the northeastern state of Meghalaya alone, you’ll still find incredible diversity of culture, religion, and politics. Unfortunately, diversity all too often means division, even in the church. 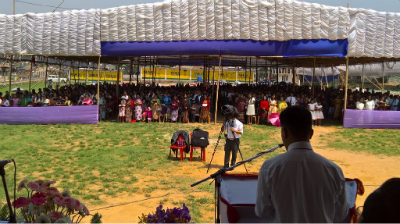 So it happened that Jim Lyon, whose history with India predates his service as general director of Church of God Ministries, was invited to speak to two separate assemblies of the Church of God in India. Providentially, the timing of both recent gatherings allowed Jim to make one trip and speak to both groups. Between an earthquake, cyclonic winds, and golf ball-sized hail, a concept, now familiar to the Church of God in the United States and Canada, was introduced that focused a divided region of the Church of God on their common subject. 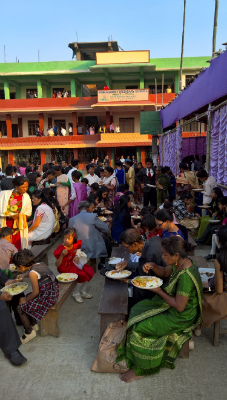 Photo: Feasting and felllowship with the Church of God Ecclesia. Until Jim arrived, neither group knew the other had invited Jim to Meghalaya. And until 1940, the Church of God in Meghalaya was one. A.D. Khan and Nichols Roy, two primary pioneers of the Church of God in India, no doubt envisioned a single body of the church. While there is much more history to be told, retold, and evaluated, in the final analysis, two groups emerged during the Indian independence movement—a group claiming to be more conservative, and a group dubbed by the other as liberal. Politics and culture also had a role to play in the shaping of the church’s history, yet each group today looks and functions in a remarkably similar fashion. Both groups lift up the name of Jesus Christ and serve him with fervor and grace, framed by the global Church of God movement. The group that onlookers might describe as more conservative is known as Ecclesia. A yearlong celebration of their seventy-fifth anniversary at Umsning would conclude with Jim as guest speaker. 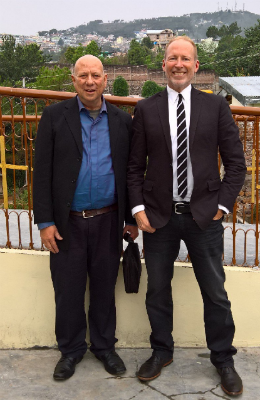 To the south, the Qualapatti group—directly descended from Nichols Roy—would convene at the Nongthymmai church for the twenty-fifth anniversary of the Nongthymmai congregation. The Ecclesia group gathered by the thousands under a massive outdoor tent, in addition to overflow on the lawn and balconies of surrounding buildings. 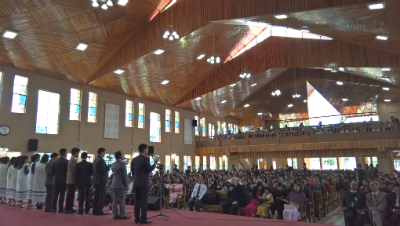 The Qualapatti group convened in the enormous new sanctuary of the Nongthymmai church, also spilling outside. Though drawing crowds not nearly the size of a Church of God centennial celebration at a soccer stadium fourteen years ago—one report suggests 100,000 attendees—each gathering still saw impressive numbers. Photo: Gathering of the Church of God Ecclesia under a massive tent. For a while, it seemed that the idea wasn’t resonating. But at the conclusion of the message to the Qualapatti group, Bakyrman Nongplugh, who was chairing the service that night, took a rather unusual step in light of local church culture. Moments of invitation and response in Meghalaya don’t always resemble what Westerners have come to formulate. But something was different on this closing night of the celebration. Inviting the believers to the front of the building, Bakyrman asked Jim and multiple other pastors to stand at the front and pray with those who needed to respond to the message. Hundreds of people stood in line for prayer, confessing sins, seeking repentance, and wanting to put Jesus first. “This went on for at least ninety minutes,” Jim recalls. “The powerful stories of heart-cry, redemption, and healing…honestly, it was one of the most powerful moments I’ve experienced in years. Even after it was over, people still hung around and just wouldn’t leave, because there was so much life in the room. When Jesus is the subject, there is so much power that is unleashed from heaven’s gate. The world isn’t waiting for another church meeting. They’re waiting for Jesus.” Incredibly, but not surprisingly, the Ecclesia group also responded in a remarkable way to the message that Jesus is the subject. Photo: Jim Lyon stands with Steve Nichols-Roy, grandson of Nichols Roy. This entry was posted in All Church of God and tagged Ecclesia, global, India, international, Jesus Is the Subject, Jim Lyon, Meghalaya, Nichols Roy, Qualapatti, unity. Bookmark the permalink.